And since this series survived to Issue 300 in tough, comic-book times meant that lots of other people enjoyed the trials and tribulations of John Constantine as well. And why not? This series has some of the best written comic scripts in the past 20 years. To me, Hellblazer validated the comic medium into an adult medium. It was 'For Mature Readers Only' from the very beginning, and not just because of naughty pictures. Garth Ennis takes us to a pretty familiar place... After all, men have been bartering their souls in fiction with the Infernal Realms since the days of Faust. But then he throws in John Constantine... a man who once sold his soul in a very calculated fashion to three Devils just to get out of lung cancer... Cheeky bugger. While John Constantine is no hero... he's a saint compared to Danny Drake. 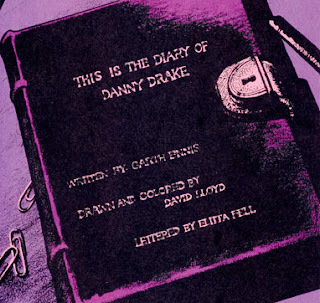 In true horrific fashion, Danny Drake shows us how far fear and desperation will take a man. Good stuff, Mr. Ennis. A nice retelling of a classic with a familiar end. I'm not a huge fan of David Lloyd's art. Yes, he did "V for Vendetta" and that worked well. But his Chiaroscuro style never seemed right for newsprint and a 4-colour press to me. It's distinctive to be sure, but would be better suited for covers than interiors. To each his own, I suppose. Nonetheless, the story certainly works even if it has more stippling than I'm used to.